It is becoming widely recognized that our society must transition to low-carbon energy systems to combat global climate change, and renewable energy sources are needed to provide energy security in a world with limited fossil-fuel resources. While many clean power-generation solutions have been proposed and are being developed, our ability to transition to a low-carbon society is prevented by the present lack of clean and renewable energy carriers that can replace the crucial roles that fossil fuels play, due to their abundance, convenience and performance, in global energy trade and transportation. Any future low-carbon energy carriers that aim to displace or supplement fossil fuels must have high energy densities for convenient trade and storage, and should be consumable within efficient high-power-density engines for transportation, heavy machinery, and other off-grid energy applications. Hydrogen and batteries have been widely studied but they are not suitable for use as international energy-trading commodities and they cannot provide the energy density and safety demanded by society. Metal fuels, produced using low-carbon recycling systems powered by clean primary energy, such as solar and wind, promise energy densities that are competitive to fossil fuels with low, or even negative, net carbon dioxide emissions. To date, however, few practical high-power-density end-use devices for generating heat or power from metal fuels have been proposed. 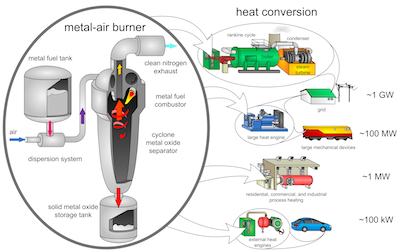 We propose a novel concept for power generation in which metal fuels are burned with air in a combustor to provide clean, high-grade heat. The metal-fuel combustion heat can be used directly for industrial or residential heating and can also power external-combustion engines, operating on the Rankine or Stirling cycles, or thermo-electric generators over a wide range of power levels. The energy and power densities of the proposed metal-fuelled zero-carbon heat engines are predicted to be close to current fossil-fuelled internal-combustion engines, making them an attractive technology for a future low-carbon society. Q. What is the difference between a source of energy and an energy carrier? A: A source of energy can be directly harvested from the earth or the sun. This includes fossil fuels, solar, wind, hydro and nuclear energy. Energy carriers are produced using a source of energy and include batteries, hydrogen, compressed air, fly-wheels and, of course, metal powders. Q. What are the products of metal combustion? A: Combustion of metal powders produce only metal oxides and do not produce any greenhouse gases. Q. What happens to metal oxides after combustion? A: Metal oxides can be captured and stored after combustion. They can then be recycled using any available source of energy. Q. What source of energy can be used to recycle metal oxides? A: Any source of energy can be used. Ideally, the powders would be recycled using a carbon-free source of energy, such as solar or nuclear, to have a complete cycle with no greenhouse emissions. Q. Will metal fuels be used in an internal combustion engine, similar to those found in gasoline or diesel cars? A: Metal fuels cannot be used inside an internal combustion engine. The metal powders will be burnt using a burner. The heat produced from the burner can then be used for heating buildings, process heating, or be transformed into mechanical work or electricity using an external combustion engine. Q. What kind of engines can be used with metal powders? A: Any external combustion engines can be used, such as Stirling and Rankine engines. Rankine engines are already used to produce electricity in coal and nuclear power plants. Q. What particle size is required? A: Particles are micron sized. Q. Will particles agglomerate after dispersion? A: Only nano-sized particles agglomerate after dispersion. The concept proposes to use micron-sized particles, which do not agglomerate. Q. Doesn’t aluminum require a lot of energy to be produced from aluminum oxide? A: Yes it does. But you get the same energy back during combustion, which is why it is a very interesting fuel! Q. Will this concept require a lot of metal powders, which are limited resources? A: The metal powders are recycled in this process. Iron is the third most abundant element in the earth crust and the reserves are orders of magnitude greater than what would be required. Q. What are the advantages of metal powders over hydrogen or batteries? A: The energy density of metal powders is significantly greater than that of hydrogen or batteries. Also, hydrogen poses a serious risk of accidental or intentional explosions, which is not the case with metal fuels. Q. Aren’t batteries already commonly used in automobiles? Why metal powders? A: Batteries work well in cars but have short ranges. Also, batteries have too low of an energy density to be used with heavy machinery, trucks, boats and trains. Q. Where else can metal powders be used? A:Metal powders can be used to provide energy in remote locations, to replace fossil fuels in industrial and commercial heating, provide energy for industries and can be used inside closed spaces where fossil-fuel emissions can become toxic to humans. Q. How can energy be traded with metal fuels? A: Currently, only fossil fuels can be traded internationally. Electricity can only be used in the vicinity of its place of production and sold to a limited market. Metal powders produced from electricity can, however, be traded in a similar fashion to fossil fuels anywhere on the planet. Q. How can metal fuels help increase the penetration of renewable energy? A: Production sites of renewable energy are often remote and far from major cities, where a significant portion of electricity is used. Metal powders can be produced on the site of renewable energy production and shipped, globally, to consumers.